This bronze tablet, over a metre high, set in the wall of Brookfield Unitarian Church, is one of the earliest of Cassidy's works we have found on public display. Although passed by thousands of people daily as they hurry along busy Hyde Road in Gorton, Manchester, it is not mentioned as a Cassidy work in any of our reference works. We owe its 'discovery' to Janet Wallwork, a local historian of Gorton, who, while searching for something else, discovered Cassidy's name on a history website of the South-Eastern Railway of India, a user of the locomotives built at the Gorton works established by Charles Beyer and Richard Peacock. Richard Peacock, in a picture from the year before his death. Richard Peacock as modelled by Cassidy. 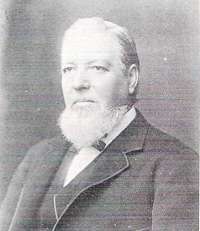 Richard Peacock was born in Healaugh, Swaledale, Yorkshire on 9 April 1820, the seventh son of Ralph Peacock, who when Richard was young, was working on the construction of the Leeds and Selby Railway. The family then moved to Leeds where Richard attended the Grammar School, leaving at 14 for an apprenticeship with locomotive builders Fenton, Murray and Jackson. In 1838, aged just 18, Richard was taken on by the Leeds and Selby Railway as their Locomotive Superintendent. There was scope for the young to progress in the railway world of the 1830s as there has been in the Internet world of modern times! The Leeds and Selby was merged into the York and North Midland, which itself later became part of the North Eastern Railway, and is still in use in the twenty-first century. Peacock moved on to the the Great Western Railway, and then in 1841 gained a position as locomotive superintendent of the Sheffield, Ashton-under-Lyne and Manchester Railway, which was being built at that time. 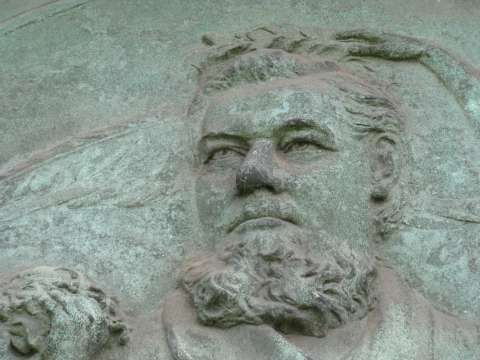 He chose and developed a site at Gorton for the company's locomotive works, where locomotives were built and overhauled by the company and its successors for many years. workplace - it was universally known as 'Gorton Foundry' - and both men became prominent local citizens. Richard Peacock was married twice. He had two sons, Ralph and Joseph, by his first wife Hannah Crowther, then two daughters, Jane and Eugenie, and a son, Frederick, by his second wife Frances Littlewood. 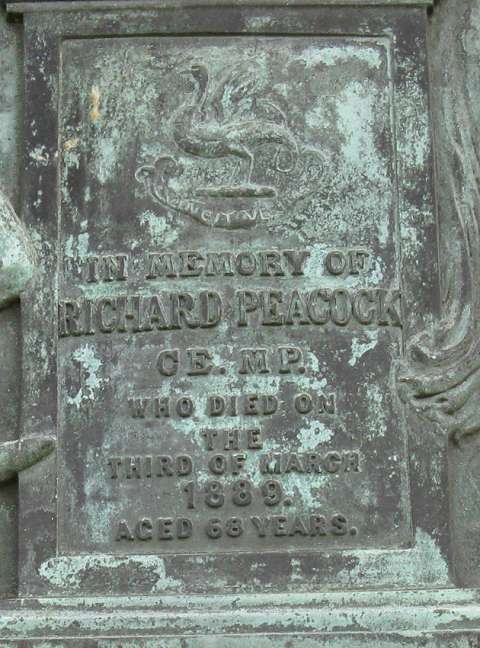 His eldest son, by then Colonel Ralph Peacock of the Manchester Volunteer Artillery, succeeded him at Gorton Foundry, and was himself succeeded by G.P. Dawson, the husband of Richard's daughter Eugenie. 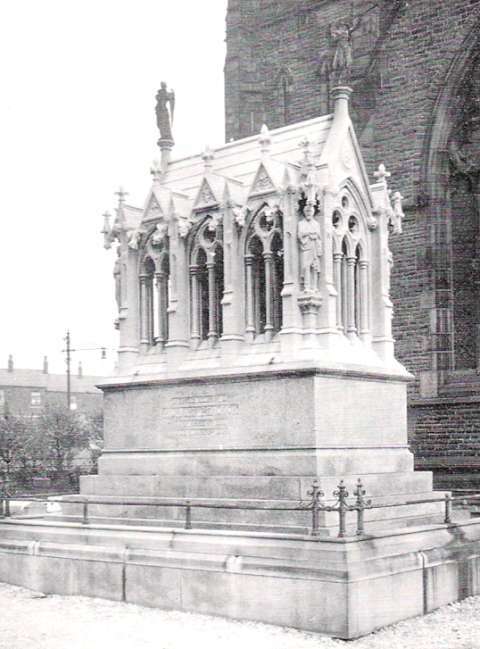 Like a number of engineers of his day, Richard had political aspirations, and as the memorial tablet relates, he became Member of Parliament for Gorton in 1885, a seat which he retained until his death on 3 March 1889 at the age of 68. In 1902, Beyer Peacock became a public company, and in 1907 they were approached by H.W. Garratt with a view to manufacturing a type of articulated steam locomotive he had invented. The Beyer-Garratt became the company's most famous brand, many examples being exported, being ideal for hauling heavy trains on lines with sharp curves and steep gradients. By the 1950s, with steam locomotives out of favour, Beyer Peacock found themselves in difficult times; they did build some diesel and electric locomotives, as well as diversifying into other areas of engineering, but the Gorton Works closed down in 1966 and has been demolished. Gorton Hall, the stately home of Richard Peacock, which he developed from the remains of a hall dating back to the 1600s, has also long-since disappeared, having been demolished in 1906, although a lodge survives. The church, his plaque and the mauseoleum remain to keep his memory alive. Manchester is famous for its cotton industry, but no less important at one time was the building of railway locomotives. The first was Experiment, built in 1833 by the Sharp brothers in their Atlas Foundry alongside the canal near Oxford Street in the city centre. The works was in a confined space with no rail link, and in 1881 they moved their business to Glasgow. William Fairbairn built his first loco at the Canal Street works in 1839, and many hundreds were built there until 1862, although again, the products had to be taken out by road. Most larger British railway companies built their own locos, and two of them did so in Manchester. The Lancashire and Yorkshire Railway works at Miles Platting, on the line out of Manchester Victoria station, until a new works was built at Horwich in Lancashire following a disastrous fire at the Miles Platting works in 1875. The Manchester, Sheffield and Lincolnshire railway (later to become the Great Central) established a loco works in Gorton, then very much a rural area, in 1848, at Richard Peacock's suggestion. This works lasted until 1963, although in its later years locomotive construction ceased and only overhauls were done there. The later Beyer Peacock works was on the opposite side of the line. As mentioned elsewhere in this feature, it was Beyer Peacock who in 1966 had the honour of building Manchester's last locomotive. The last, that is, until a working replica of Planet, a loco originally built in 1830 for the Liverpool and Manchester railway, was constructed in the workshops of the Manchester Museum of Science and Industry in the 1990s. James Nasmyth began locomotive building at the Bridgewater Foundry in Patricroft, just outside Manchester, in 1840, alongside the Bridgewater Canal and adjacent to Patricroft station on the Liverpool and Manchester line. The firm became Nasmyth Wilson & co, and built very many locos, specialising in the export trade. Output declined in the 1830s, and in 1940 the factory was taken over by the Government to become a Royal Ordnance Factory, which was later sold to British Aerospace and closed down in 1989. Some of the original buildings can still be seen as part of the 'business and technology centre' which has been developed on the site. Beyer Peacock, locomotive builders to the world, by R.L.Hills and D.Patrick. Glossop, the Transport Publishing Company, 1982. 303p, illustrated. Biographical dictionary of railway engineers, by John Marshall. Second edition. Railway & Canal Historical Society, 2003. Gorton Local History Group website. Includes articles about Brookfield Church and Richard Peacock, as well as a bibliography of Goron history. 'Progress is not an accident but a necessity. It is part of Nature. Some confuse progress with motion and are entirely content with a merry-go-round. To progress. one must first look forward. Nothing, in progression, can rest on its original plan. We might as well think of rocking a grown man in a cradle.' - quoted in the Beyer Peacock Quartely Review, July 1929. THIS TABLET WAS ERECTED BY THE EMPLOYES [sic] OF GORTON FOUNDRY TO THE MEMORY OF THEIR LATE RESPECTED EMPLOYER WHO REPRESENTED THE GORTON DIVISION OF EAST LANCASHIRE IN PARLIAMENT FROM ITS FORMATION AS AN SEPARATE CONSTITUENCY UNTIL HIS DEATH. HE WAS A MAN OF STERLING QUALITIES, A KIND AND UNOSTENTATIOUS FRIEND TO THE POOR AND NEEDY, AND A GENEROUS SUPPORTER OF ALL AGENCIES FOR THE SOCIAL ELEVATION OF THE PEOPLE. Both Richard Peacock and his business partner Charles Beyer were church-goers, but of slightly different theological persuasion, and both decided to fund a new church for their community; in a spirit of friendly rivalry, the legend has it, they agreed that the first to be completed would have a peal of bells. Peacock's Unitarian Church, a replacement for the ancient Gorton Chapel, was the 'winner' and got its bells (inscribed with Mr Peacock's name) although it appears to have actually opened later than Beyer's Anglican church of St James. According to Robert Siddall, the church was given as a thanksgiving for the recovery of his daughter from a serious illness. The church, built in a field by the Gore Brook - hence the name Brookfield Church - was designed by Manchester architect Thomas Worthington, a prominent Manchester Unitarian, and opened in 1870. Richard Peacock is commemorated twice at 'his' church - three times if you view the church itself as a memorial. 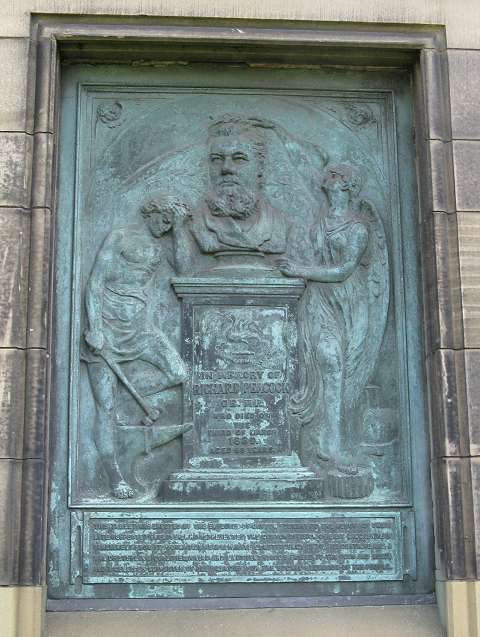 The plaque on the outside wall, facing the main road, was designed by Cassidy in a sentimental style featuring a mourning blacksmith (rather inappropriately dressed for his profession) with is hammer and anvil to symbolise the world of locomotive engineering, and an angel looking up to Peacock's new home in heaven. The bird forming the family crest is, you may think, the eponymous peacock, but in fact it is a cockatrice, 'a legendary creature, resembling a large rooster with a lizard-like tail' - chosen by Richard for his family crest. 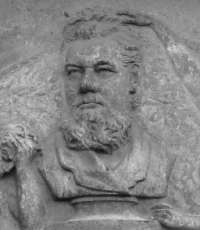 The inscription 'John Cassidy sculptor 1889' can be distinguished amid the corrosion at the bottom of the tablet. The tablet was paid for by a collection around the Beyer Peacock works, which in 1889 employed a total of 1735 men and boys, so it would not have been too difficult to raise the few pounds Cassidy would have asked for the design and modelling work. The actual casting was done in the Gorton Foundry itself, according to a history of the church written by its Minister, Rev. Cottier, in 1953. Craftsmen there would have been experts in brass and bronze casting, as there are many such parts in a locomotive. As an eminent Victorian, a simple grave would not do justice to Richard Peacock: instead the extraordinary structue shown above was created to house his remains, and placed in a dominant position on the churchyard. 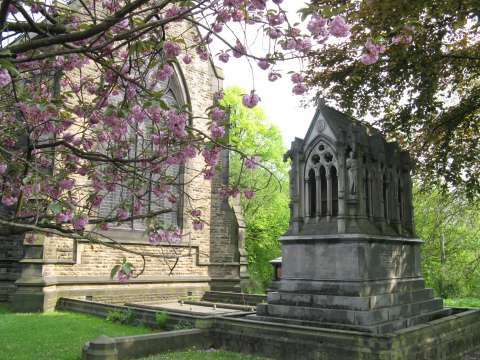 Also designed by Thomas Worthington, it further commemorates his son Ralph (1838-1928) and his younger son Joseph, born in 1839, who had died before his father, in 1875. 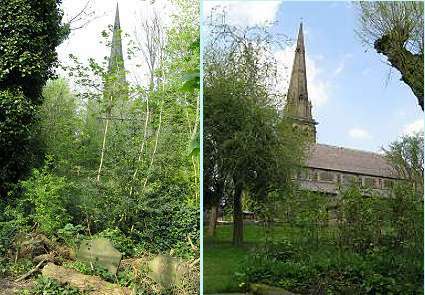 Although I live just a few miles from Gorton, I had never visited the place before until I travelled there in May 2008 to take the pictures for this feature. 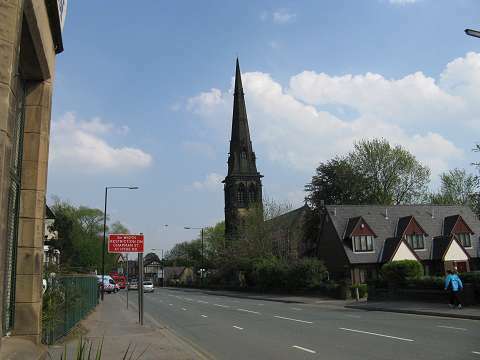 I was pleasantly surprised at how many rural features it retains, at least in the area around the church, despite being very close to the City of Manchester and bisected by a busy and wide road - alighting from a bus opposite the church, I had to walk a considerable distance to find a safe place to cross. 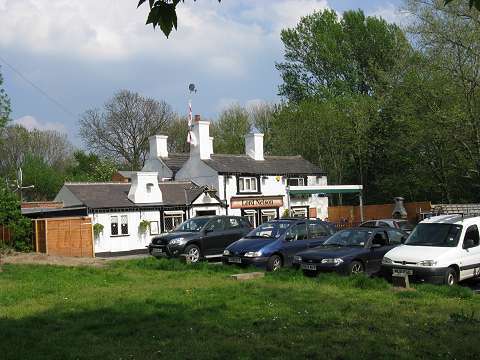 The Lord Nelson pub (picture above) is over 300 years old, according to its website, and looks just like the inns found in villages out in the countryside. There's a heritage trail, nature exhibits, and a pleasant park. Strolling around the back lanes, one can approach the churchyard from the side away from the road. A odd feature is the number of gravestones, presumably from the graveyard of the old chapel, which seem to be scattered around amongst the undergrowth. Although they built their last loco in 1966, it is believed that over 350 of their locomotives still exist, including the very last one, Class 25 diesel D7659, which was saved for preservation by music producer Pete Waterman. The majority of these, epecially those still in working order were built after Richard Peacock's death. One exception is Lancashire & Yorkshire Railway no. 957 (British Railways No. 52044) an 0-6-0 goods engine which works on the Keighley and Worth Valley heritage railway in Yorkshire, although this was not a Beyer Peacock design. 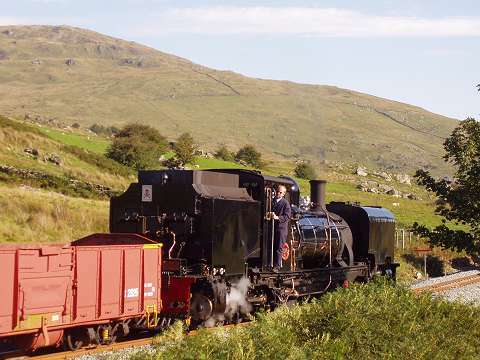 The Isle of Man Railway ordered all its locomotives from Beyer Peacock, and several are still used, including No.4 Loch which was delivered in 1874. To find the oldest survivor one has to travel to Sweden where 2-4-0 mixed traffic steam locomotive Swedish State Railways (SJ) no 3, Prins August, built in 1856, and also 2-2-2 passenger steam locomotive SJ no 75, Göta, built in 1866, and preserved in thenational railway museum No. 3 was one of six locomotives resulting from an order gained from the Swedish Government Railway during a visit by Charles Beyer to Hamburg in 1855. The Dutch State Railways were also good customers, and purchases over 600 Beyer Peacock locomotives over the years, starting in 1863 with an order for eight. 2-4-0 no. 13 of 1865 is preserved in the Netherlands railway museum, Utrecht. Peacock travelled to Holland to supervise the test running of the first locos, and letter from him describing his experiences survives in the National Library of Wales, which has the archive of Henry Robertson, third partner in the founding of the Beyer Peacock firm. In Manchester, the Museum of Science and Industry has important Beyer Peacock collections. The archives of the company are all kept there for use of scholars, and in the 'Power Hall' of the museum are products of the company, including one of the first Isle of Man locomotives and a huge Beyer-Garratt brought back from South Africa. A fine place to travel behind a Beyer Peacock product is the Welsh Highland Railway (Caernarfon) which works many of its trains with narrow-gauge Beyer-Garratts re-imported from South Africa, including the last steam locomotive built in Manchester, no.143 of 1958, seen above working in 2006, with Snowdon in the background. Text and modern pictures by Charlie Hulme, 2008.